It was the dawn of the third age of television, many years before networks would discover the power of long-form storytelling, when Warner Brothers helped former Murder She Wrote writer J. Michael Straczynski realize his dream to cross The Lord of the Rings with Casablanca...IN SPACE! The resulting series would revolutionize television storytelling. The year is 1994, the name of the show is Babylon 5! Join us, both B5 novices and veterans, as we recount this great series' absolutely essential moments. It's easy to forget now, in the age of Battlestar Galactica, The Walking Dead, American Horror Story, Breaking Bad, Sons of Anarchy, Lost, Deadwood, The Wire, Homeland, and oh so many other series, that there was once a time when long-form storytelling was all but nonexistent on television. Prime time audiences, it was believed, were too fickle and inconsistent to follow stories that play out over multiple seasons. Now, in the age of internet recaps, fan and insider podcasts and the proliferation of media about media, the long form is seen as a way to promote viewer loyalty and online buzz. It is the one-off, bad-guy-of-the-week series that now feel like the dying breed. Babylon 5 represented not only a turning point in the form of television drama, but in the relationship between show creators and their audiences. Straczynski and Warner Brothers were aware that the show would rise or fall with word of mouth and were thus unprecedentedly open about their process and about the production of the series. The pilot movie, The Gathering, was heavily promoted online in an era when few people knew what "online" meant. Transcripts of discussions Straczynzki had with the fan base during the production of the series can still be found, along with synopses and analyses of each episode, at The Lurker's Guide to Babylon 5. It is impossible to do any sort of analysis of this series without significant spoilers. Babylon 5 has a great many enjoyable set-ups and payoffs, so if you are interested in getting into the series but do not want to read the spoilers in the article below, I have created a separate list of essential episodes broken down by season which you can find here. Stop reading now if you don't want to know what happens. The show takes place aboard the eponymous space station Babylon 5, located in neutral territory in deep space. Babylon 5 is the fifth of the Babylon stations. The first three were destroyed by terrorists and the fourth mysteriously disappeared before coming online. Babylon 5's primary purpose is diplomatic. It's a galactic UN/WTO, providing a place where the galaxy's different alien races can negotiate trade and territory. It was established 10 years after a war between Earth and an alien race known as the Minbari ended with the mysterious surrender of the Minbari just at the moment of their final victory at The Battle of the Line. Basically Gettysburg...IN SPACE! Jeffrey Sinclair - The first commander of Babylon 5, Jeffrey Sinclair was abducted and held by the Minbari during the Battle of the Line. Sinclair was hand-picked by the Minbari government to run Babylon 5, bypassing several more-qualified candidates. Delenn - The Minbari ambassador to Babylon 5 and member of the Minbari government's ruling Grey Council. G'Kar - The Narn ambassador to Babylon 5. The Narn are a prideful, warrior race who had once been subjugated by and are now in ongoing conflict with an imperialist race known as the Centauri. Londo Mollari - The Centauri ambassador to Babylon 5, Mollari's conflict with G'Kar is both political and personal. Mollari's life is the tragic tale of a man ever caught between goodness and greatness. Alfred Bester - a high ranking member of Earth's secretive "Psi Corps," an only somewhat totally fascist organization run by telepaths. Played in "Evil Chekov" mode by Walter Koenig, this character could only have been improved by the judicious application of a goatee. Bester was not a regular character on the show, but he does play a critical role in the unfolding of the main story arc. John Sheridan - Babylon 5's second commander, assigned to the station after Jeffrey Sinclair is recalled to Earth for bad acting. Sheridan is the only human captain to have ever scored a victory over the Minbari in battle. Sheridan's wife, Anna, disappeared along with the rest of the crew of the archaeological research vessel Icarus while investigating a mysterious alien world, giving truth to the old adage that one should never sign up for duty onboard a ship named "Icarus." These characters acted as so-called "trapdoors" for the main characters. Straczynski knew that telling a five-year story on television would leave him vulnerable to losing actors, so he always made sure that there were backup characters available to fill in for each of the main characters. Ever the author of virtuous lemonade from necessary lemons, Straczynski makes this "trapdoor" strategy a theme of the show. Many of the characters, most notably Delenn, are heard to comment that should they fall in their struggle, others will rise to take their place. What are the absolutely essential episodes of Farscape? But also similar to Farscape, Babylon 5 has a major story arc which constitutes the meat of the show. If you don't like the major arc meat, you probably won't get much out of the standalone potatoes. The major story arc, the Shadow War and its aftermath, plays out over five seasons with each season constituting a chapter in the epic. While there are many good standalone episodes that are worth watching (A Late Delivery From Avalon, Grey 17 Is Missing, Gropos), my main criterion for selecting episodes is advancement of the Shadow War story. 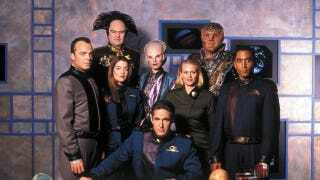 In addition to the main series, there are also a number of television movies that contribute to the Babylon 5 story. I have not included these films in this article, as they are few enough that if you like the show, you ought to seek them out. The first season of Babylon 5 consists mainly of Star Trek-like alien-of-the week episodes. The main arc episodes in this season present many questions without providing many answers. Signs, portents, prophecies, significant glances, secretiveness and evasiveness lay over Season One like a shroud. The key issues addressed are Sinclair's experience at the Battle of the Line and the subsequent Minbari surrender, the conspiracy to overthrow the government of Earth and the subsequent assassination of President Santiago, and the emergence of a new...or rather, very, very old...alien race that threatens the galactic peace. 108 - And the Sky Full of Stars - This episode explores Sinclair's experiences at the Battle of the Line and reveals that Delenn was present at his interrogation. It's also the first instance of someone saying "if I fall, another will replace me." 118 & 119 - A Voice In The Wilderness pt 1&2 - This episode introduces Draal and the Great Machine on Epsilon 3, the planet which Babylon 5 orbits. The Great Machine is an homage to/ripoff of the Krell technology from Forbidden Planet. When the alien operator of the great machine dies, he is replaced by Draal, Delenn's Obi-Wan Kenobi-like mentor. 120 - Babylon Squared - Having become unstuck in time years earlier, Babylon 4 reappears and the crew hurry to rescue survivors before it disappears again. To complicate matters, it appears that a hirsute alien named "Zathras" is trying to steal/borrow/commandeer the station for use in a great war. 122 - Chrysalis - In the season finale, Delenn goes into a chrysalis to transform into, well, we don't know yet, Garibaldi is shot in the back by his own second-in-command and the president of Earth dies when his spacecraft explodes under mysterious circumstances. If you have to pick one episode to watch from season one, it has to be Babylon Squared. This is the first episode that truly makes a contract with the viewer that all these mysterious half-significant bits of portent and prophecy are actually going somewhere. Having seen a few episodes prior to this one, Babylon Squared hooked me back in the day. And, for once, the promised payoff does come (cough, Lost, cough.) Walter Koenig's portrayal of Alfred Bester in Mind War is also the beginning of what will be a wonderfully villainous run for Evil Chekov. Season Two introduces Babylon 5's new commander, John Sheridan. Straczynski, having difficulty both with Michael O'Hare (who didn't adjust well to acting on television) and with the excessive narrative weight he'd laid on Sinclair decided to split Sinclair into two characters, one who would play out the messianic human/Minbari destiny and the other who would command the forces of Light in the Shadow War. The main arc of Season 2 deals with the buildup to the Shadow War. The Shadows' modus operandi is to stir up trouble among the younger races, and we see those conflicts playing out in this season, in particular the Narn/Centauri conflict, the dissolution of the Minbari ruling order and Earth's continuing slide into Orwellian dictatorship. 201 - Points of Departure - This episode introduces John Sheridan and provides an answer to the questions surrounding the Battle of the Line. Long story short: the Minbari discovered that the souls of their dead were being reincarnated on Earth and that by killing humans they were killing their own people. Sinclair is one of these reincarnated Minbari and this was discovered during his examination. This is why the Minbari surrendered and why they've been helping humans ever since. 202 - Revelations - In this episode, we discover that the Shadows are known to G'Kar and that the Narn have written about them in their ancient history. Delenn emerges from her chrysalis and is now half human/half Minbari. She does this in order to become a bridge between our two peoples and not in any way to make her more visually appealing for when she falls in love with Sheridan. We also learn that the Shadow homeworld is a barren and evil place known as "Z'ha'dum." Yeah, it does sort of sound like "Khazad-dum" now that you mention it. 208 - A Race Through Dark Places - Bester returns in this episode to investigate an underground railroad for rogue telepaths being run through Babylon 5. 209 - The Coming of the Shadows - One of the most tragic moments of the season comes when the Centauri emperor visits Babylon 5 and gives G'Kar a glimpse through a door to peace for their respective peoples, shortly before it slams shut. This episode also introduces the Rangers, a group of wandering fighters similar to the Rangers in The Lord of the Rings. And by "similar to" I of course mean "exactly like." 213 - Hunter, Prey - A messenger from Earth comes to Babylon 5 with critical evidence implicating the current president in the murder of previous president, only to be interrupted in his mission by Bull Shannon from Night Court. 215 - And Now For A Word - This episode provides an external overview of the show as a team of reporters does a story on Babylon 5. This episode provides a useful recap of the critical elements on the show and also advances the Narn/Centauri war. 216 - In The Shadow of Z'ha'dum - In this episode we discover that itinerant sleazebag and Mollari benefactor Mr. Morden was on board the ill-fated Icarus, suggesting the possibility that Anna Sheridan may too have survived. This episode also introduces what is perhaps the most famous prophecy in a show where prophecies are thick on the ground when Kosh tells Sheridan "If you go to Z'ha'dum, you will die." And so he will, in a Buffy Summers kind of way. 219 - Divided Loyalties - one of the trapdoors springs when Andrea Thompson trades in Psi Corps Black for NYPD Blue and Patricia Tallman returns to her role as Babylon 5's original resident telepath. 220 - The Long, Twilight Struggle - Draal returns, 30 years younger and centuries more melodramatic and Lord Refa, Londo's frenemy in the Centauri Royal Court, presses a final solution to the Narn problem. 222 - The Fall of Night - With their home world devastated, Sheridan gives sanctuary the Narn over the objections of his own government. The increasingly creepy Nightwatch, the enforcement branch of the Earth government's equally creepy Ministry of Peace, prepare to seize control of Babylon 5. Only until this present crisis is over, you understand. We are at war. With, you know, terror. As soon as terror surrenders, we'll give you your rights back. When Sheridan nearly dies in a bomb attack, he is rescued by Kosh who reveals himself to the entire station to be, or at least to appear to be, whatever your race's name is for "an angel." The tragedy of Londo and G'Kar's relationship reaches a high point in The Coming of the Shadows. When G'Kar, newly optimistic about a future of peace between the Narn and the Centauri, offers Londo his hand in friendship while Londo knows that war with the Narn is underway, it's difficult not to feel your heart sink. It would not be amiss to state that, generally speaking, if you're watching Babylon 5 for the acting, you're in for a thin soup. But Peter Jurasik and the late Andreas Katsulas stand out as notable exceptions. These two great actors infuse Babylon 5's most complex and nuanced character relationship with the depth the story needs to be more than a long series of video game cut scenes. The look on Jurasik's face as he oversees the bombing of the Narn home world stands out as another moment where the heartbreak of their tragic story shines through. It's as though he feels the pain of the Narn as sharply as G'Kar does. In Season Three, the conflict with the Shadows becomes a shooting war as Delenn and Sheridan, lacking adequate support from their home governments, consolidate their defenses around Babylon 5. At this point in the series, it becomes increasingly difficult to isolate essential episodes. As the Shadow War story arc builds, there are fewer and fewer one-off episodes. 301 - Matters of Honor - In this episode we are introduced to Marcus, the romantic, virginal, happy-go-lucky-yet-serious-and-soulful Ranger who in no way represents the self-image of the show's fan base. We further find that Mr. Morden is (shock surprise) working with the fascists in the Earth government. This episode also introduces The White Star, a Minbari/Vorlon battle cruiser designed to give the Army of Light some small hope of not being instantly destroyed by the Shadows. 305 - Voices of Authority - Marcus and Ivanova seek Draal's help in tracking down the few remaining "Old Ones," the god-like alien peers of the Shadows and the Vorlons. A political officer bearing a striking resemblance to (and possessing about as much charisma as) a Fox News on-air correspondent arrives at the station evidently intent on sleeping her way to the middle. 306 - Dust to Dust - G'Kar gets his hands on a drug designed to activate latent telepath genes and mind-fucks Londo, literally. In this episode, we learn that there are currently no Narn telepaths, but there once were. A thousand years ago. Which was the last time the Shadows were on the move. 308, 309 & 310 - Messages From Earth/Point of No Return/Severed Dreams - In this three-part series, Babylon 5 severs its ties with Earth. Having discovered a vessel buried on Mars, the Earth government has been actively trying to develop Shadow technology. Sheridan uses the White Star to destroy the Shadow vessel. In response, Earth sends a fleet to seize control of Babylon 5 only to be turned away by Delenn leading Minbari fleet. That would be the fleet that could have destroyed Earth without getting winded. 314 - Ship of Tears - Bester returns to ask for help tracking a ship containing "weapons parts" that turn out to be cybernetically enhanced telepaths stored in suspended animation. Shadow vessels, it seems, are vulnerable to attack by telepaths, so the Shadows have been working with Psi Corps to train telepaths to fly Shadow vessels. Bester, offended that the Shadows are muscling in on his territory of coercing telepaths into service and equally put out that they chose his girlfriend as one of their pilots, joins with Babylon 5 in their struggle. 315 - Interludes and Examinations - Londo's girlfriend is murdered by Morden who pins the killing on Lord Refa, creating a split between the two that Morden hopes to exploit. Dr. Franklin exchanges his addiction to stims for an addiction to self-righteous smugness, Sheridan convinces Kosh to have the Vorlons attack the Shadow fleet directly and Kosh is murdered by the Shadows in retribution. 316-317 - War Without End parts 1 & 2 - The check written in Babylon Squared is paid off in this brilliantly constructed two-part series. Jeffrey Sinclair returns to Babylon 5 and Delenn announces that Babylon 4 is needed to win the previous war against the Shadows one thousand years ago. Straczynski quite consciously eschewed using time travel in Babylon 5. He regarded it as a cheap trick that other shows use to erase the consequences for dramatic actions. The circle of conflict and rebirth told in Babylon Squared and War Without End is the single exception. Sinclair not only travels to the past to fight the Shadows, but he also uses the same technology Delenn used to transform herself to transform himself into a full Minbari. And not just any Minbari, but Valen, their greatest religious leader. All of the prophecies and portents that formed the Minbari religion were facts personally known to Sinclair. In this series we also see glimpses of the future, including the fall of Centauri Prime. 320 - And The Rock Cried Out, No Hiding Place - Londo lures G'Kar to the Narn home world where he is subject to arrest by Lord Refa. This is one episode that is worth not spoiling. G'Kar obviously survives with his freedom intact, but beyond that you just have to see how it plays out for yourself. 322 - Z'ha'dum - Anna Sheridan arrives on Babylon 5 and persuades John, who is now in love with Delenn, to return with her to Z'ha'dum where we learn more about the conflict between the Shadows and Vorlons. The Vorlons are lords of order, believing that the younger races must be trained and disciplined into evolving. The Shadows are lords of chaos who believe that the younger races can only evolve through conflict and rebirth. The history of war between the two races boils down a battle between these two philosophies. Sheridan listens patiently to the Shadows' pitch and then blows up their capital city with a nuclear weapon he smuggled on board The White Star. Moments before the nuke goes off, he jumps, without a refrigerator or anything, and falls into a cave far below. If Z'ha'dum is a reference to Khazad-dum, then I guess Anna Sheridan would be the Balrog, which is bad news for Sheridan. Who wouldn't rather face a fire demon than their ex? I can still recall the excitement my water cooler friends and I shared knowing the last episode of season 3 was called "Z'ha'dum" and seeing the "Z minus X days" titles at the head of the episodes leading up to the finale, but my personal favorite episode of this season has to be And The Rock Cried Out No Hiding Place. The evolving relationship between Londo and G'Kar is incredible in this episode and the finale of the Londo/G'Kar/Refa arc is one of my favorite sequences in the series. War Without End is also a great moment in the series. It was gratifying indeed as a fan to have my three year investment in the program pay off and it strengthened my hope that the rest of the series would play out just as well. These episodes are also worth watching for the late Tim Choate's performance as the ever put-upon Zathras. No one listens to poor Zathras. And, of course, Delenn's monologue as she stands down the Earth fleet in Severed Dreams is a fan favorite. What was difficult in Season Three has become impossible in Season Four. Babylon 5 was originally planned to play out the Shadow conflict and the liberation of Earth from President Clark well into Season Five, but the show was threatened with cancellation after Season Three, so Straczynski pushed the conclusion of the war into Season Four. He also took upon himself the herculean task of writing each episode of the season himself. As emperor Cartagia says, you can't leave these things to others, they never get it right! Instead of an episode-by-episode breakdown, I'll summarize the events of this season as though it was what it is: one big long episode. John Sheridan dies at Z'ha'dum, but his soul and/or body (it's not entirely clear) are caught by Lorien, who is a member of the first species in the galaxy to attain sentience. Lorien breathes enough life back into Sheridan for him to survive another twenty years and the two return to Babylon 5. The Vorlons, now represented by a much harsher and more sadistic ambassador whose name is "Kosh" just the same as every other Vorlon (why not call them "Koshes" instead of "Vorlons? "), escalate the conflict with the Shadows into a scorched galaxy genocide, destroying entire planets where the Shadows have any influence. Meanwhile, the new Centauri emperor, Cartagia, begins exhibiting signs of madness and is bribed into helping the Shadows in exchange for promises of godhood. Of course there was no way to predict that an emperor whose name rhymes with "Caligula" would turn out to be crazy. G'Kar is arrested by the Centauri while looking for Mr. Garibaldi and agrees to help Londo remove the insane Cartagia from the throne in exchange for the liberation of Narn from Centauri rule. The war between the Shadows and Vorlons plays out to a final conflict where Sheridan announces to both races that the younger worlds are no longer interested in choosing sides in a fight between bickering parents and tells them, in what is still the best line in science fiction television history, to "get the hell out of our galaxy." "Please stay and help us clean up the mess you two made" just didn't have the same ring, I suppose. After the end of the Shadow war, Sheridan turns his sights to the liberation of Earth. Mr. Garibaldi, who was captured by a Shadow vessel during the battle at the end of Season 3, is brainwashed by Bester and betrays Sheridan by luring him into a trap. Sheridan is arrested and tortured by the Earth government who want to use him as a reformed poster child for anti-alien sentiment. Garibaldi, realizing that he has been manipulated, helps rescue Sheridan and Sheridan and the Mars Resistance return to liberate Earth from the government of President Clark. Vir looking up at Morden's head on a pike and waving as he prophesied he would definitely ranks as one of the high points not only of the season but of the show, but The Deconstruction of Falling Stars, which shows us glimpses of the future of the Babylon 5 universe is the must-see episode of the season. The episodes with emperor Cartagia are also quite enjoyable. Wortham Krimmer's determination not to be upstaged by Peter Jurasik and Andreas Katsulas results in a giddily over-the-top "more is more" performance that is simply not to be missed. What was impossible for Season Four is much easier for Season Five. Having won a reprieve from cancellation, Straczynski found himself without adequate time to develop a compelling second half to his story. Consequently, this season has more standalone episodes and many of the major arc episodes set up stories that are paid off in other media including the television movies, novels and comics. Though it didn't make the cut as an essential episode, my favorite moment of season five is definitely Penn and Teller playing the previously referenced but never seen vid comedians "Rebo and Zooty" in episode 508 Day of the Dead. Hey Zooty! Zoot! Zoot! The Fall of Centauri Prime is another high point in the season, as we see the tragic fate of Londo and G'Kar played out. In a season more concerned with looking forward than looking back, this episode is a strong reminder of what made the first four seasons so enjoyable. Overall, Babylon 5 was our last, best hope for the future of rich storytelling on television. It succeeded. In the years that would follow, increasingly satisfying long-form stories would become as common on television as lurkers in Down Below. Jason Shankel is a writer and creative developer currently working on the dawn of the fourth age of television at the Stupid Fun Club.